Speaking of cameras, Huawei claims to have the world's tiniest front camera featuring a 25MP sensor. Huawei Nova 4's front camera set inside the punch hole has 25 megapixels and an f/2.0 aperture, plus electronic image stabilization for the 1080p video recording feature. Huawei's artificial intelligence modes will be available on both front and rear cameras. With this outstanding camera and high photo quality, taking photos might be your new interest. And backup your photos in time is one of the important thing you need to do. We introduce you three method to backup your Huawei Nova 4's photos in time. Syncios Manager and Syncios Data Transfer can help you much. Syncios Data Transfer supports to transfer all photos in camera roll or pictures you saved somewhere. Other types of contents are also support to backup. 9 categories of data are for you to select. First of all, please install and launch Syncios Data Transfer on computer. 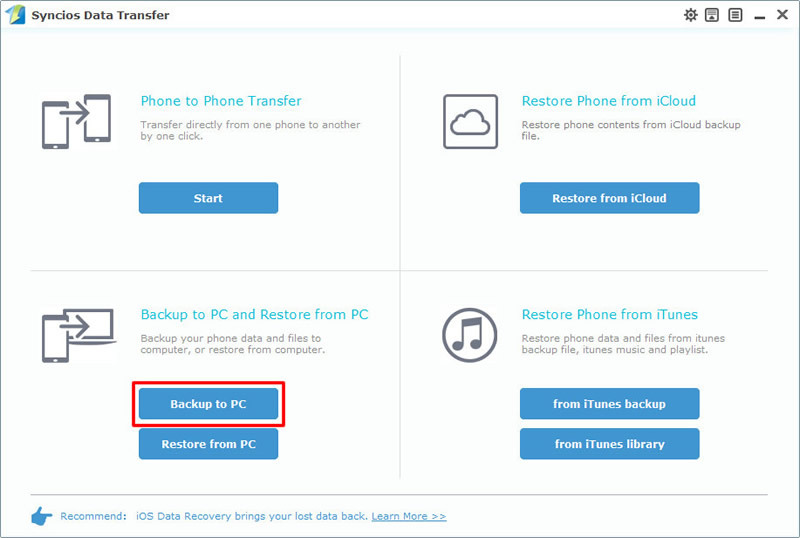 There are main functions of Syncios Data Transfer, they are 'Phone to Phone Transfer', 'Backup to PC and Restore from PC', 'Restore Phone from iCloud' and 'Restore Phone from iTunes'. 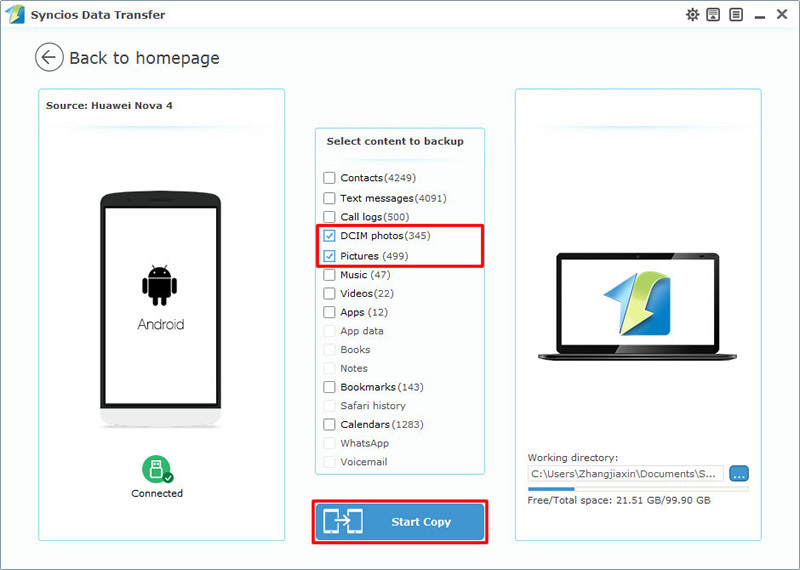 We choose 'Backup to PC' option here to transfer photos from Huawei Nova 4 to computer. Connect your Huawei Nova 4 to computer through USB cable or by using Wi-Fi connection. Wait for Syncios to sync Huawei Nova 4. 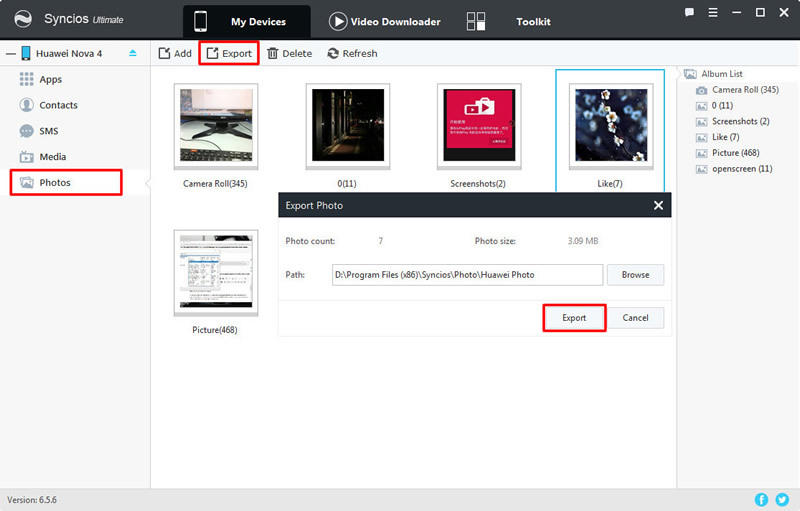 Once the syncing process has finished, choose 'DCIM photos' and 'Pictures' in the middle interface. Then click 'Start Copy' to launch and wait till complete. Tips: Encounter any detection problem during the process, please check our Android detection tutorial for help. Wi-Fi connection only works when Huawei Nova 4 and computer are both accessed to the same network. If you want to backup certain photos selecting by yourself, we recommend you to use Syncios Manager for help. Photos will show by timeline and you can re-backup the latest photos in time. Whole photo folder or certain photo file can all be backed up perfectly. Now please install Syncios Manager on computer first. Launch it and connect Huawei Nova 4 to computer. Five main categories of contents will list on the left side, simply choose 'Photos' option and wait for Syncios to sync all Huawei Nova 4's photos. 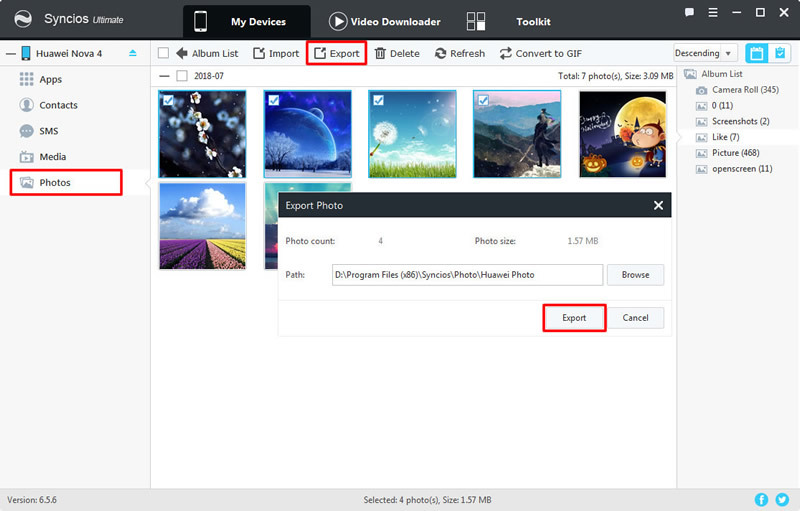 To backup certain photo folder, select the certain photo folder and click 'Export' button on the menu bar. Choose your saving path and click 'Export' button to launch. To backup certain photo file, please b the certain photo folder to enter. Then you can select desired photo files and do the same operations as the above showed. Notice: Syncios Manager's 1-Click Backup and Restore function is only available for Syncios Manager Pro and Ultimate users. If you are interested in it, please click here to know more about it. 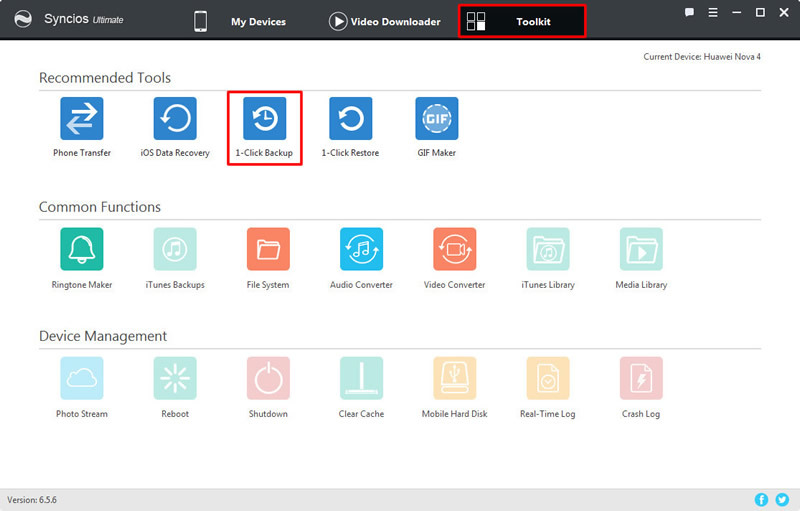 Now launch Syncios Manager and connect your Huawei Nova 4 to computer. 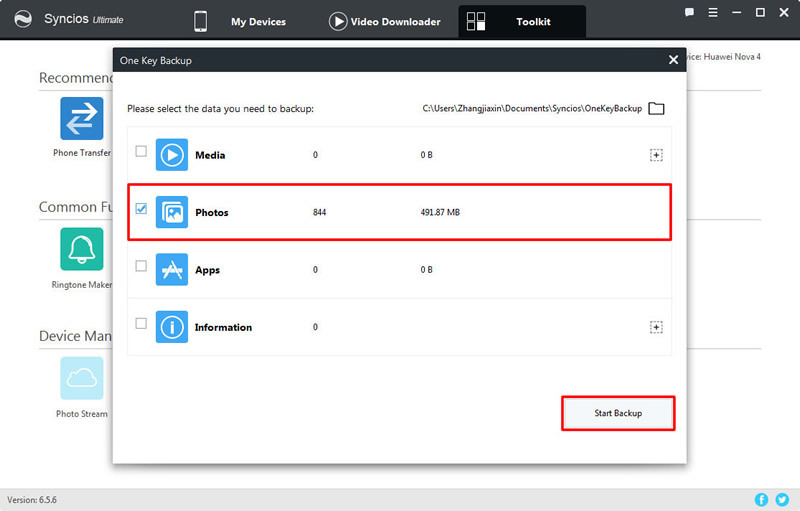 Then go to 'Toolkit' module and choose '1-Click Backup' function and wait for Syncios to synchronize your data. There are four main transferring contents, you can also click the expand button behind to select more contents. We choose 'Photos' option here and click 'Start Backup' to launch.